Full Swing Golf is an advanced golf performance center and hi-tech country club in one – the perfect facility to represent the KZG brand. 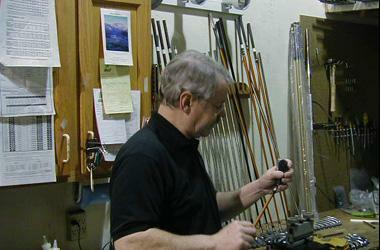 In addition to their state of the art launch monitors and computerized fitting systems – the only such equipment in the entire state of Alaska, Owner John Gose has an expansive showroom and seven different simulators for year-round play. It’s no wonder Full Swing Golf has become the hub for local golf leagues and lessons year round. With his 20-plus years in the business, it’s also no surprise that John Gose was named one of the World’s Top 100 Club Fitters for thirteen straight years (2006-2018). Come by and give some of their numerous KZG demo clubs a test at Pebble Beach, St. Andrews, or Kapalua. You’ll have a great time and improve your game in the process. Find and follow them on Facebook: Full Swing Golf of Alaska! *What’s in John Gose’s bag: GF-460 driver, VC-F #3 wood, H370 Tour 18* hybrid, ME-1 irons 3-PW, TRS wedges 52* & 56*, KZG banana putter.